JACKSON, Miss. – Dr. Katie McClendon, assistant dean for student services in the School of Pharmacy on the Jackson campus, was elected as a 2016 Fellow of the American College of Clinical Pharmacy (ACCP). The ACCP is devoted to the advancement of clinical pharmacy, which focuses on the science and practice of medication use. Fellowship in the ACCP indicates demonstrated excellence by a clinical pharmacist. 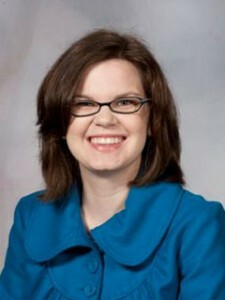 Dr. Katie McClendon, associate dean for student affairs on the Jackson campus. McClendon has served as a clinical pharmacist for more than 10 years, and currently practices in two University of Mississippi Medical Center clinics. She’s been an active member of ACCP for eleven years, serving on its women’s health and ambulatory care committees, as well as in the mentor program. As part of ACCP, she advocated for including student pharmacists in clinical pharmacy research and scholarship, as well as contributed to several publications. McClendon will be inducted during the fall meeting of ACCP on Oct. 23 in Hollywood, Florida.